Now that it’s August 30, and the Tabaimo show at the Hara Bijutsukan has finally closed (the final day was August 27), I guess it’s finally time for me to say a few things about it. I suppose the point of a pre- August 27 post would have been to get you excited to go to the show at the Hara, but now the point of the post is to get you excited about the next Tabaimo show, which you should keep your antennae tuned for. I went to the Hara Museum of Contemporary Art with my friends Taro-kun and Koba-chan while Paul was busy giving interviews. We were all excited to see the Tabaimo show, and Taro and Koba were excited to show me the Hara, which I had never been to before. The Hara turns out to be a small, concrete building, and just the perfect size of museum. It reminds me a bit of the Berkeley Art Museum, though cut smaller and without the permanent display of Hans Hoffman. Smaller museums are really much more conducive to encounter and enjoyment, and you really feel no need to rush from piece to piece in a sort of frenzied attempt to tabulate it all. Instead you can relax and drift from work to work, and circumambulate outside for a cigarette, if that’s what you want, or have some coffee, if that’s what you want, and then come back inside and relax and think for a bit. And then please enjoy the aesthetic disjuncture and the strange conceptualities with your friends because art is more fun if it’s social. Every museum should make you feel like you’re enjoying time in your most incredible friend’s most incredible parlor, not like you’re standing in the lobby of some officious, glass-boxed ministry of culture. In the quotidian scenes of her work, her motifs are tatami-mat rooms in private homes, public baths, and commuter trains that evoke a sense of nostalgia. In these scenes, Tabaimo reveals the darker side of contemporary Japanese life — juvenile crime, suicide, feelings of disempowerment. In a detached style that has become her trademark, she coolly depicts the dangers lurking in the space between the usual and the unusual, exposing them to public view. But the vision of Japanese Kitchen is far darker than traditional art, evoking a society with problems that seem increasingly uncontrollable. In a particularly clever sequence satirizing unemployment, a woman opens her refrigerator to find a miniature man dressed in a suit and working busily at his desk. Plucking him from the refrigerator, she proceeds to cut off his head, a visual pun on the Japanese expression kubi ni naru (literally, to become a neck), meaning someone has lost his job. The kitchen itself seems to symbolize modern Japanese society in general. 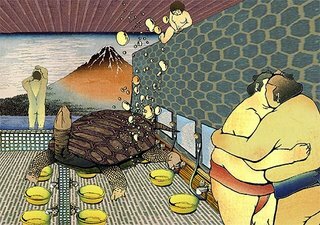 While chopping her food, the woman listens to a radio weather forecast that calls for “clusters of high-school student suicides.” Cockroaches scurry around, suggesting not only pollution but also another pun, this time on gokiburi teishu (literally, cockroach husbands), who, after becoming unemployed, hang around the house making a mess. What this analysis fails to convey, however, is the incredible visual humor of these sequences. I mean, brains boiling in pots on the stove are funny — especially when it’s your classic obaasan that’s taking the knife to them. Similarly, the death of the salaryman is at the same time horrible, fantastic, and somewhat thrilling as a kind of imaginative surprise. Clearly, Tabaimo’s critique of Japanese society, and the immense sense of alienation that seems to pervade everything, is also an imaginative effort to fill the flat spaces of the world with aesthetic enjoyment, no matter how perverse and guignol that enjoyment may turn out to be. The feeling in the crowd at the Hara wasn’t a feeling of ghastly realization and horror, but rather a kind of appreciation of the particular execution of horror-humour-critique mounted by Tabaimo’s awesome and immense bag of skills. The image above is from Tabaimo’s video installation Japanese Bathhouse — Gents (2000), which I haven’t seen. But it was one of the few decent images I could find out there in the ether. Hopefully the James Cohan Gallery won’t spank me for borrowing it. If you find you have a wild desire to purchase some of Tabaimo’s work, please feel free to contact the James Cohan Gallery at the link given on the bottom of the page. 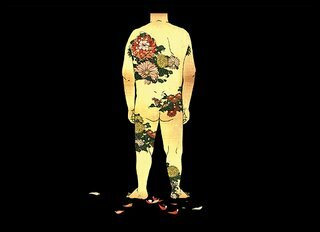 This is a still from Hana-ra, an animated investigation of irezumi (tattoos). First a bee appears to pollinate the flowers. Then (if I remember correctly), a butterfly. A carp swims lazily beneath the surface of the man’s skin. The petals on the flowers slowly begin to decay, and drift off the man’s skin and onto the ground. Soon entire flowers are cascading suddenly to the earth. Then, surprisingly, the man’s skin itself begins to flake into sheets, which curl and drift to the ground. Skin, in its decay, also becomes a beautiful petal, an object of grotesque beauty. I’m not sure where this image comes from, although I suspect that it’s from the Japanese Bathhouse installation. There are two things that are important to notice about this image. The first is the ukiyo-e style that Tabaimo employs in her work; this is a commentary on the history of woodblock images, but it’s a commentary that incorporates the beauty of the citation in a manner that exceeds mere citationality. Tabaimo’s images are simply stunning in their use of color, and fade, and ukiyo-e motifs. The second thing to notice is Tabaimo’s almost obsessive use of the image of peeling skin, or of unzipping, in order to reveal a second substance, a hidden thing behind the skin, that erupts as horrifying meaning, or beautiful transfiguration. In a sense, everything is always a moment of becoming in Tabaimo, even if that becoming is forced to emerge from the sterile traces of bathroom tiles or the cess-holes of public restrooms. I think it’s a kind of true guignol hope. It’s the Walker Art Center Tabaimo page. Click here to see a film clip, and an interview with Tabaimo (in Japanese). A Metropolis article on Tabaimo. And another article in Kateigaho International. Finally, here’s another article at re-title.com. If you go this site, you can watch some videos of Tabaimo’s work. Finally, here’s the James Cohan Gallery page, if you want to invest in some Tabaimo.